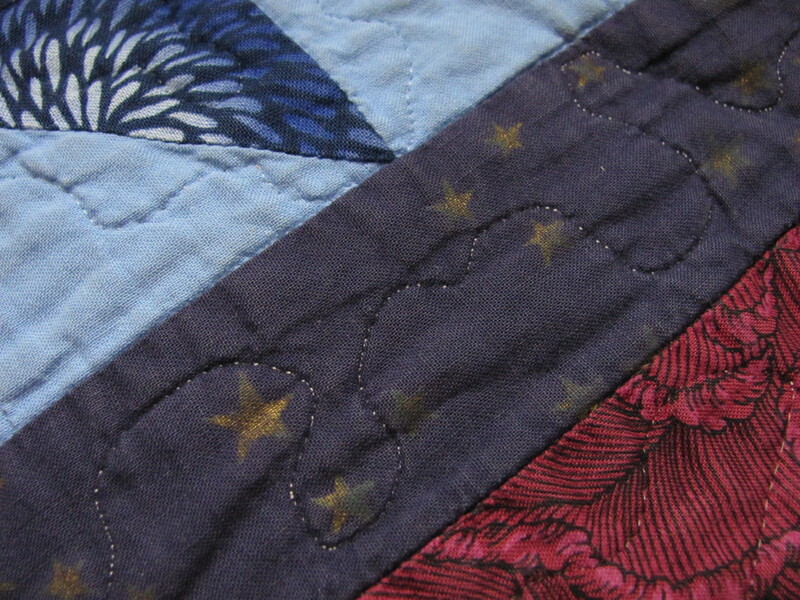 Gold-printed stars tarnished on a well-loved quilt, leaving smudges. Quilt and photo by Barb Gorges. The longevity of a quilt depends not only on the care it receives, partly remedied by having a quilt care label on it, but also the quality of its materials. Spend some time with old bed quilts and you will see how a quilter’s choices play out. My mother found and gave me an old, well-worn double nine-patch scrap quilt that was made with a collection of all kinds of fabrics, everything from a little bit of terrycloth to filmy chiffon. Many of the less hardy weaves (and knits) had disintegrated and the batting was fluffing out in many places. But the plain “quilting” cottons were wearing their age well. If you are going to make an important bed quilt, you’ll want to buy best quality fabric so that it does age well and whoever owns it in the future will want to take care of it and not use it as a dog bed. How do you find good fabric? As a general rule, we figure the big box stores have seconds and quilt shops have top quality. But once in a great while I’ve been lucky at Wal-Mart and unlucky at a quilt shop. There are two ways I judge fabric quality: the fabric itself, and the color. Spend a lot of time at quilt shops and feel the expensive fabric. It has a good thread count—but not so much that the fabric feels like sail cloth, though batiks have a much tighter weave than regular quilting cottons. Good fabric isn’t too thin, but not as thick as broadcloth. Thick or high thread count fabric is difficult to hand quilt (does anyone hand quilt anymore?). Thin fabric won’t wear as well. Too much finish can be added to fabric. I’ve bought nice, crisp fabric—great for piecing. But it never relaxed in the wash. Sometimes a stiff finish washes out and has been hiding a light-weight fabric you would not have bought. Quality of color is the other aspect I look at. In a multi-colored print, colors are printed separately and need to register, or line up, correctly. Are those flower centers supposed to be set in some abstract design a quarter-inch away from the center of the circle of petals? Look at those dots on the selvedge. Each little circle (some companies use more creative shapes) in the row should be filled perfectly with each color. There may be some extra circle outlines if a print doesn’t have a lot of different colors. Watch out for prints that feel like they are painted on. I ordered a red nightgown with white polka dots and when I received it, I realized I could feel each dot, as if I could pick them off with my fingernail. Over time, color applied this way, instead of with dye, will crack. All those luscious prints sparkling with gold highlights have a similar problem. I used a navy blue fabric printed with gold stars for a quilt for a son who used it every night for more than 10 years. The stars tarnished. Otherwise, the quilt has a wonderful patina of wear and love. Another quality of fabric is color fastness. It’s foolhardy to put a lot of work into a quilt without testing for bleeding. I make up a little potholder-sized quilt, alternating squares of dark and light colored fabrics I plan to use, layer them with my preferred batting and backing and machine quilt through each square. Then I wash the quiltlet in hot water and detergent and let it air dry slowly. That’s how I catch reds that creep into whites, or colored backing dyes that migrate to the front along quilting lines. Also check for print motifs sliding sideways. Any fabric that doesn’t make the cut should be returned to the store. If it’s been in your stash a long time, make dog beds with it. Light-fastness is something else you can check if you aren’t in a big hurry to start your project. Cut a 2-inch square of each fabric and tape them to a south-facing window for a couple weeks, then compare with the original yardage. Navy blue is the unstable color I’ve seen most often, turning lavender. OK, so I have a wall hanging with a block that’s now lavender and green instead of blue and green. But in another block in the same quilt, a different navy blue is still strong. Unless you truly only need to make a quick, disposable quilt, use the best fabric available. You and your quilt deserve it.